Courtney Botelho-Cho and Delrey P. Foia, both 9, show off their new pink slippers at the Mayor Wright Homes Community Association's children's Christmas party Thursday, when the kids received the rubber slippers fulfilling resident Alyn Vasquez's Christmas wish. IT STARTED simply enough on local Internet discussion forum HawaiiThreads.com with a topic titled, "Christmas Wishlist." Just before Halloween, forum member "Doc1456" asked, "What do you want for Xmas?" The usual suggestions followed: a new job; a laptop computer; world peace; motorcycle; underwear; kitchen appliances; gift cards. Then "1stWahine," or "AuntiePupule," also known as Alyn Vasquez of Mayor Wright Homes in Kapalama, chimed in with her wish. "I wish for all the children of MWH to have a pair of rubber slippers so they won't have to go barefoot. Somehow, even if I'll be one month late in getting them their slippers ... I'll make sure they'll get it!" Alyn Vasquez, resident of Mayor Wright Homes, stands fronting her apartment with 500 pairs of Locals Footwear rubber slippers that were purchased through spontaneous donations from an online community on HawaiiThreads.com. IMMEDIATELY, forum participants jumped on the idea. "TutuSue," Sue Larkin of Reel Services/Hawaii Inc., offered, "Anything any of us can do to help? Like purchase? Deliver? Expedite delivery? Whatever? ... Please?" and the idea was off to the races. Vasquez, along with Mayor Wright Homes residents Marleen Lafaele and her sister Luaai Lafaele went door-to-door surveying each household for the kids' names and shoe sizes, eventually compiling a list of 388 children. It was decided that 500 pairs were needed to cover any children that were missed. "Pomai" started the discussion of where they might get good prices on rubber slippers. 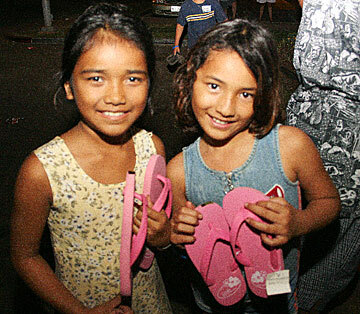 One participant volunteered a connection to Waipahu slipper wholesaler Zori Zori Inc., distributor of Locals Footwear slippers. When contacted, Noreen Nakaoka of LocalsFootwear.com offered to sell a large quantity of slippers to the group at near- or below-cost. "But those only come in pink, purple and green!" said Nakaoka. Vasquez was consulted and replied, "Pink/purple/green is FUN!" In the mean time, Larkin was contacting film industry friends and evangelizing the effort. She extracted pledges and donations over lunch and at meetings. Larkin collected enough on her own that the group started looking for other gifts to add to the children's Christmas fun. Donations came in from online readers locally and from as far away as Washington, Oregon, California and Arizona from forum members with names like "Miulang," "Lurkah," "Leo Lakio," "AbsolutChaos," "Pomai" and "D'Alani." Timai Matatia, 9, is happy with his green rubber slippers at the Mayor Wright Homes Community Association's children's Christmas party on Thursday, when the kids received the rubber slippers fulfilling resident Alyn Vasquez's Christmas wish. 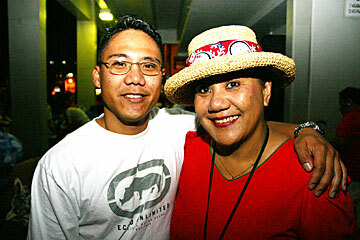 COMEDIAN Paul Ogata, also a participant in the HawaiiThreads.com discussions, mentioned it on his "102.7 Da Bomb" radio show, urging all his listeners to log on and donate to the cause. On Thursday, one of the participants drove to the Waipahu slipper warehouse to pick up the order for delivery to Vasquez's Mayor Wright home for the community Christmas party scheduled for that evening. 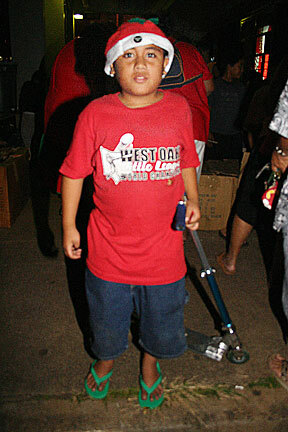 That night, at the Mayor Wright lanai area, residents gathered for their Christmas celebration and the colorful rubber slippers were awarded to each child, along with other gifts and treats. SSgt. Conrad Vasquez, a soldier with the 25th Infantry Division, left, with his mother, Alyn "Lynn" Vasquez. Conrad went to the Mayor Wright Homes Community Association children's Christmas party to help mom with her mountain of slippers. But one HawaiiThreads.com wag, only known as "Lurkah," posted this cautionary note: "Wonderful idea, Auntie. I just wanted to remind you about something. Small kid-time, the last thing I wanted was to wear anything on my feet. I went barefoot everywhere I went ... no problem running over jagged a'a lava rocks down at the beach or playing Hawaiian-style football on the streets with asphalt so hot the black tar used to melt. The bottom of my feet were tough like rawhide, and I loved it. "So don't be surprised if some of those kids refuse to wear them rubbah slippahs." "It might be rubber slippers (to us) but it's GOLD SLIPPERS to them! "Those who gave what they could, those who couldn't only prayed. That helped, we understood. To give from your heart with nothing in return Is what it's all about. "Thursday night is the night my Christmas wish will come TRUE!"